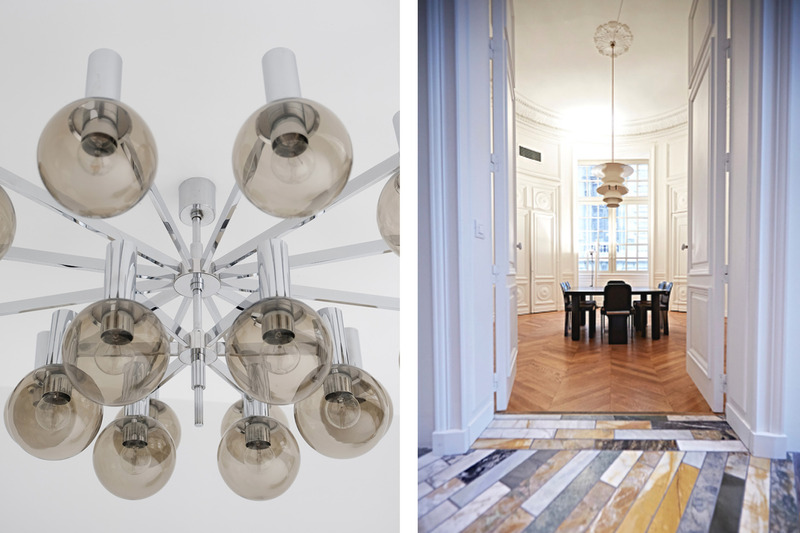 Lenz Vermeulen can be called a pioneer in online selling of modern and contemporary design. For over 16 years he has been selling furniture, lighting and decorative objects in his company City Furniture. He was one of the first dealers with his own online shop and over the years, he has built up a great reputation in his field. We had a walk and talk with Lenz about City Furniture, his passion for architecture and his plans for the future. Presentation and photography play an important role in City Furniture. Every lamp, table, chair or object is described in detailed pictures on the website. The unusual way in which the pieces are photographed gives them an extra dimension. Lenz’s photographic style is static and minimalist, which makes him stand out. No wonder a lot of his work is shared on websites and social media. Architecture also plays a role in City Furniture’s interior design projects. Before deciding on the style of an interior, Lenz looks at the age of the building and the era it is from, and the possibilities it offers. To him, it is important to connect the interior and the exterior. Apart from doing his own projects, Lenz often advises his clients on the right style for their interior. City Furniture has a very diverse clientele, and their items are shipped worldwide. Fashion labels such as Céline and Yves Saint Laurent have desks and other items from City Furniture in their offices. 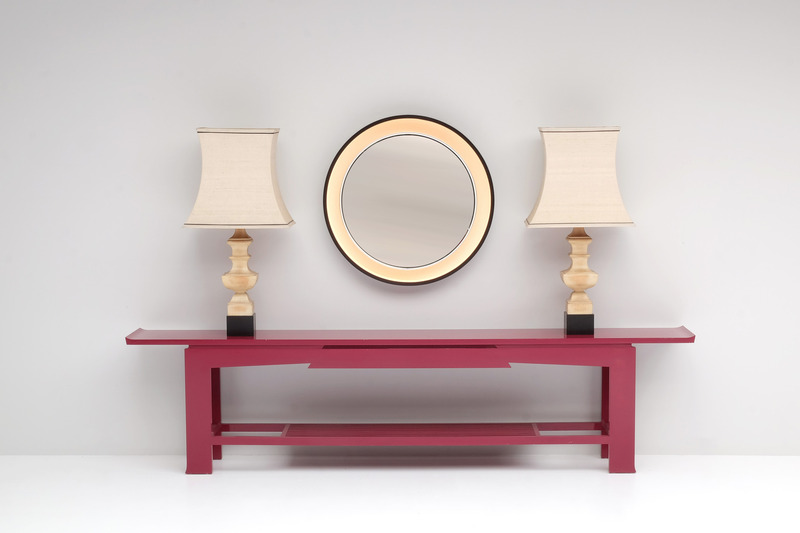 Interior designers and private collectors often share their appreciation of the diversity City Furniture offers. Apart from the online shop, City Furniture also shares a gallery with upholstery studio Cover & Couch. You can find them at the center of Antwerp. Console table, numbered and signed by Emiel Veranneman. It is the first of only three in the world, shown in the Seibu Yurakucho department store in Japan. Later it became part of the Emiel Veranneman Foundation’s collection. Left:A French ebonized chair and a daybed upholstered by Cover & Couch, as shown in the gallery. 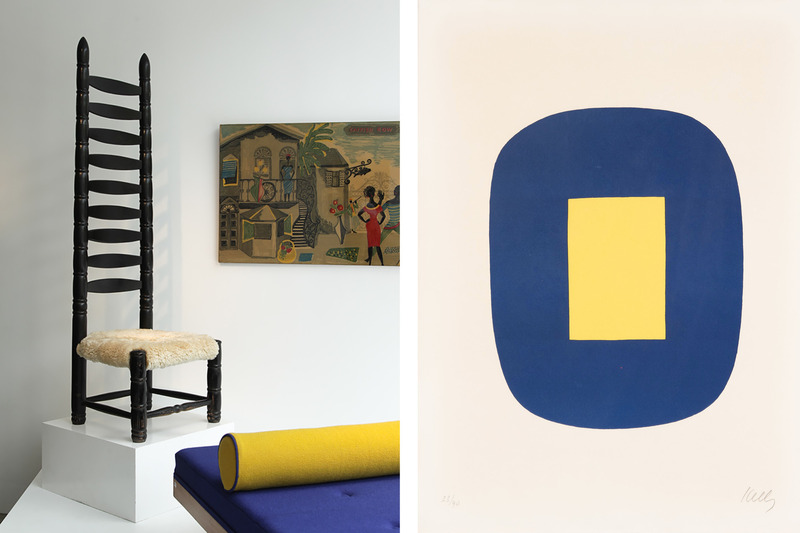 Right : Blue And Yellow by Ellsworth Kelly. This print was released on the occasion of Kellys’ first exhibition of his work at Galerie Maeght, Paris in June 1965 . This is one of the exclusive art works Lenz offers on his website. Left: Left: Detail of a large chrome chandelier, unique because of its size and the number of smoked glass globes. Right : The Paris headquarters of Céline . The chairs in the middle of the room come from City Furniture. 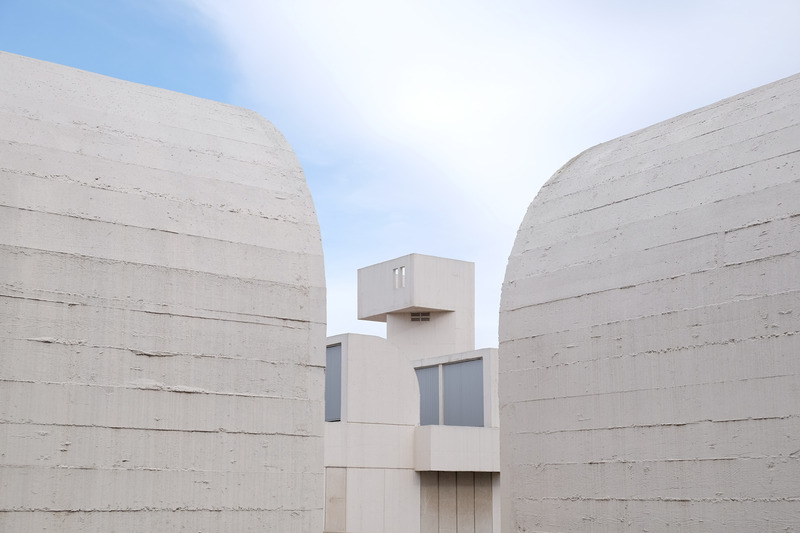 Private archive photo taken in Barcelona of the Joan Miró Foundation. Left : Portrait of Lenz Vermeulen in his gallery holding a chair designed by Alfred Hendrickx. In the background, a sculpture by artist Grégory Anatchkov, originally entrusted to the Emiel Veranneman Foundation. 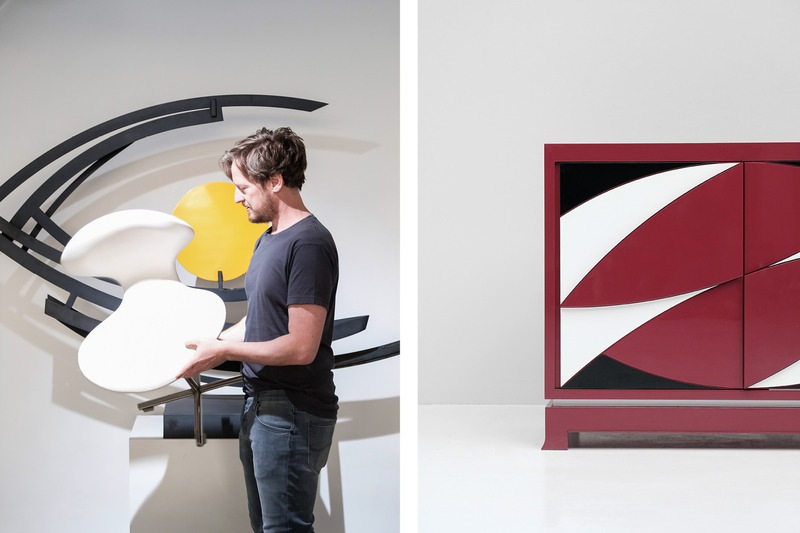 Right : Media cabinet by Emiel Veranneman, signed and numbered 1/6. 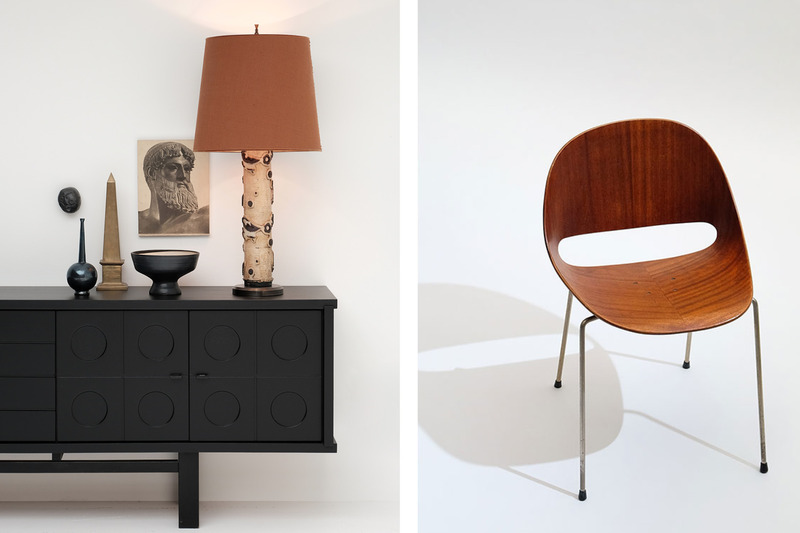 Left : A stylish, playful grouping of objects from the online gallery. Right : Exclusive chair by Belgian architect Léon Stynen, who was one of the most important architects of the 20th century. This chair is the only piece of furniture Stynen ever designed. Open Tuesday to Saturday from 2 p.m. to 6 p.m.